Which blogs are most valuable to you? You probably have a list of blogs in your head that you know you like to visit from time to time. Perhaps you subscribe to their email list or twitter feed. But how often do you actually visit their blog posts? Now you can find out how often you visit particular blogs. A Google Chrome extension, “History Trends Unlimited” gives some cool stats based on your own browsing history in Chrome. 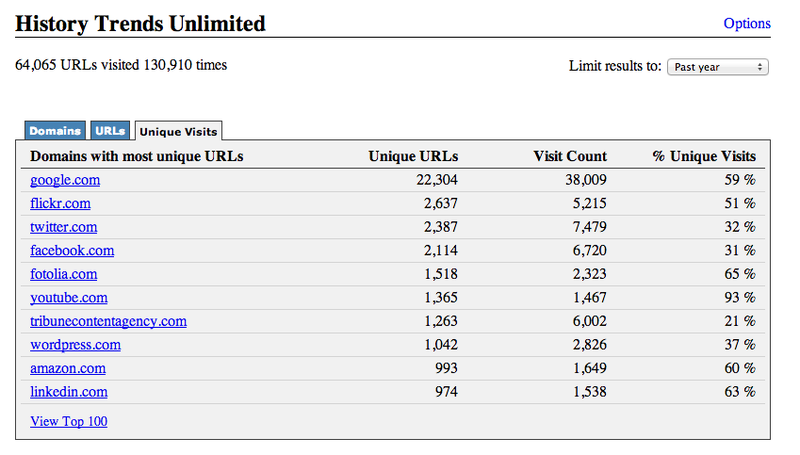 Inside this extension you can see stats like most visited domains, most visited URLs. The one you’ll be interested in is “Unique visits” that’s the domains with the most unique URLs you visited. See a screenshot of mine below (with results limited to the past year).